Think you know your sausages? Take a look at Marche's favourite salumi ciauscolo – a spreadable pork sausage that has to be tasted to be believed. When the first links of ‘nduja arrived in the UK some years ago, we fell head over heels for it. We took the spreadable Italian salumi and fried it up as a base for soups and stews, stirred it into tomato sauces or just slathered it over bread. This Calabrian delicacy might be the best known of Italy’s spreadable salumi collection, but there are many more to be discovered. 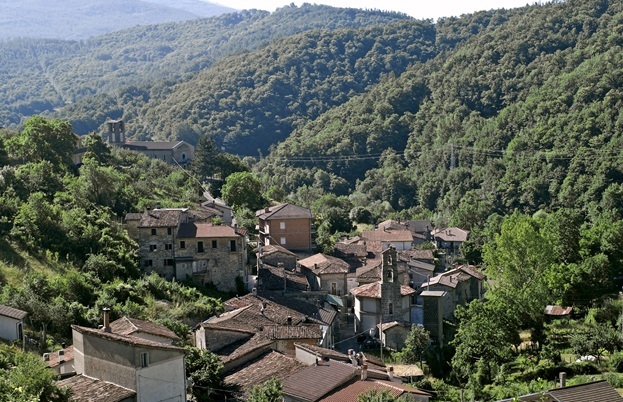 And if preserved pork is your bag, the region of Marche is the place to visit. Pork salumi is a big deal in Marche. 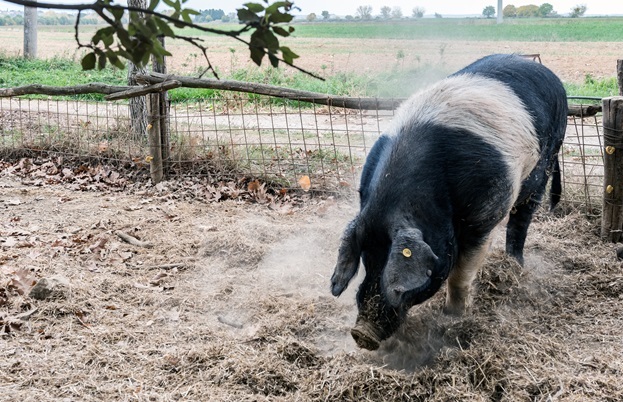 Pigs and humans have long shared the rolling hillsides of north east Italy and the marchigiani (people from Marche) have kept pigs for centuries, potentially as long ago as the fifth century B.C. The rapid downturn in temperature and scarcity of food in winter meant families couldn’t afford to keep their pigs, so instead they found ways to preserve the meat year-round. This was the origin of the Italian salumi tradition, and Marche has an almost overwhelming selection of things for you to try. 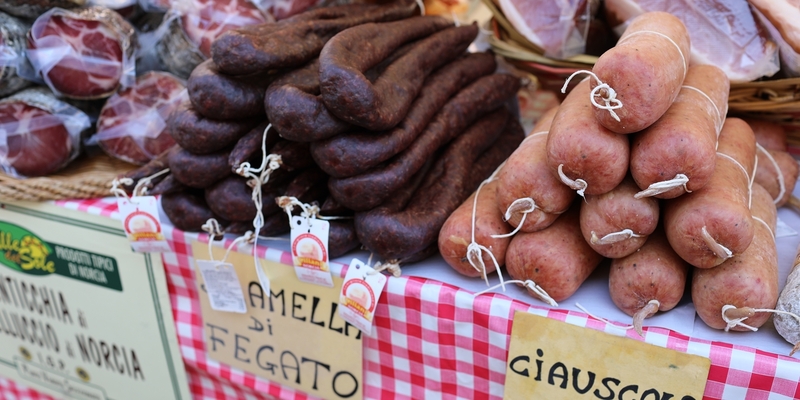 There’s ciarimbolo – a spreadable paste of pig guts, boiled with vinegar, bay leaves, basil and orange peel – mazzafegato liver sausage flavoured with orange zest and nutmeg, and better known cuts like lardo, pancetta, coppa, prosciutto and soppressata are common throughout the region. Delicious as these all are, ciauscolo is the undisputed king of marchigiani sausages. Its soft, spreadable consistency is reminiscent of Calabrian ‘nduja, or even a French pâté – indeed, this salumi may have originally arrived in Italy courtesy of the French many moons ago. Whoever is responsible, they’ve done us all a favour: this heady mix of salt, spice, fat and smoke is not to be missed. As of 2009, ciauscolo was granted PGI-protected status, which means it must be made in the area around Macerata, Ancona and Ascoli Piceno. Like many preserved meats across Italy, it’s still made to time-honoured traditions. Shoulder, loin and belly pork is minced with ham and bacon trimmings until very fine – traditionally with a cleaver but more often these days using a mechanical mincer – before being mixed with plenty of pork fat, white wine, garlic, salt and pepper. The smooth, uniform mix is then stuffed into a casing made from the small intestine and left to cure and dry for twelve to twenty-four hours. After that, the sausage is cold-smoked over juniper wood for another couple of days, and finally hung up to finish curing. Some ciauscolo is aged as long as two months, but generally speaking the marchigiani break it open after twenty days. The distinct flavour of ciauscolo comes in part from the diet and lifestyle of the pigs – which roam freely around the countryside snacking on maize and acorns – but also from two key ingredients. The first is fennel seed – an ingredient the marchigiani love for its freshness – and the second is the aforementioned juniper wood, which confers a light, aromatic smokiness to the sausage – one that ties in nicely with the other flavours rather than overpowering. In fact, ciauscolo is so tasty that generally speaking, the locals simply eat it with a warm flatbread called tigella. Keep an eye out for spaghetti al ciauscolo too – another of Marche’s simple pleasures, where the salumi is melted down in a little oil and garlic and tossed through spaghetti at the last minute. Ciauscolo isn’t especially easy to get hold of in the UK; there are importers who sell it, but most of it stays in Italy for local consumption. Still, food this good doesn’t normally stay secret forever. Who knows – perhaps ciauscolo’s ‘nduja moment might be just around the corner.